500ml bottle poured into a Funkwerks snifter. A~ extremely dark brown with a slightly bigger head then the other 2 versions and a tiny bit of lacing. S~ mostly smoked meat, bacon, and dark malts. then some sweetness from the bourbon and a tiny bit of wine barrel funk. T~ bourbony caramel, vanilla up front. followed by smokey bacon, more dark malts and some zesty rye. a tiny bit of wine barrel funk on the finish. bourbon and maple syrup sticks with you for what seems like forever! definitely not a bad thing! M~ honestly its probably the smoothest of the series. carbonation of the bourbon version, so not bad but it could use a little more. maple syrup thickness from start to finish! O~ surprisingly not my favorite of the series. i have a feeling this version got more bourbon than cabernet or it could have something to do with the age. the bourbon might have just taken over a bit. no real complaints about that though haha, i was just hoping for a little more funk. Dark mocha brown, pretty much opaque, though not quite black. A thin tan head forms and slowly settles to a crown. Smoky, meaty nose. Burnt bacon, vinous fruitiness, dark chocolate. The smoke character is pervasive, but fairly enjoyable. Rum raisin fruitiness on the palate, smoked bacon, tannic oak, roasted malt, bittersweet cocoa. Medium-light body, fairly dry. Charred, smoky bitterness in the finish. Good, but not a beer I'd want to drink terribly often. Thanks to weeare138 for sharing this w/ froggyfrog and me. Deep brown color w/scarlet hues at the base, thick cap of medium brown w/ good retention, the bead is fine. The smell is a cornucopia of malt, wood and smoke notes, lots of caramel and toaste w/ a slight fruit scent and mild cocoa aroma w/ light graham cracker spice. I enjoyed the feel equally well and the blend of smoke and smooth malt texture is practically perfect. There is light roastiness but it doesn't stand out and the body is augmented by mild sweetness w/ a gentle yeast effect. I think this tastes incredible, world class combination of smoked porter w/ lots of creamy cocoa and lager like maltiness w/ gentle bitterness and lots of woody accents which add the the overall complexity without becoming too obtrusive. This is far and above any smoked beer I have had in recent memory. It is a great baltic porter and the wood only adds the cream to the wonderful brewed beverage fermented with care by Shaun and Hill Farmstead -a Deluxe offering I have very little to compare it to it exceeded my expectations! black as night with a thick oil like look to it and a big tan head that left streaks of lace all throughout the glass, really a damn near perfect look with a wonderful settling. aroma is deep bourbon, oak, vanilla, hints of dark roasted malts, coffee, bitter ark chocolate and a rich and roasty profile that is cut with a slight touch of alcohol, really very well done here. each sip was better then the one before as the thick liquid coated the tongue and left no room for an error. boozy bourbon and vanilla creep across the palate with hints of molasses and chocolate, chewy at times with a bit of heat left in the finish as well. warming brings out a hint of dark fruit notes that gently graze the palate. smooth and strong finish leaves a long taste that lingers forever. Thanks! I let the bottle sit out of the fridge for half an hour before pouring the beer into a snifter. A: Very dark brown and essentially opaque with a large and creamy tan head and scattered lacing. S: Like the other iterations of Fear and Trembling, the smoke profile is the most prominent aspect of this beer, redolent of beechwood and bacon. Though, I don't find it to be quite as powerful as the other two version. Maybe it's faded a bit since the release, if that even happens with smoke beers. A dark chocolate undercurrent rides the smoky tide. Roasted malt is pretty strong and there's a faint toasted presence. I detect light caramel notes as well as a restrained vinous quality, molasses, and a touch of toasted nut character. The oak is prominent throughout. Amazing aroma. T: Beechwood and applewood bacon in the flavor with an upper low bitterness and persistent dark chocolate. Vinous notes fade in and out from start to finish. Malt has an upper moderate roastiness. I detect a little plum and caramel, as well as a molasses. Bitterness begins a gradual increase midpalate as the smoke begins to wane. Is that a whisper of Utopias? The finish is smoky with a strong roasted character and accompanying chocolate. M: Lower full bodied with moderate carbonation that lends a creaminess to the beer. The mouthfeel is dry, smooth, and sticky, with not insubstantial warming on the palate. Overall: One of the better smoked beers I've had and my favorite of the three Fear and Tremblings. On draft at the Hill Farmstead Harvest festival, shortly after opening a bottle of the first (only) release. Dark brown, near black with a dark tan head that settles in to a finger thick head with abundant webs of lacing. Much more bourbon and vanilla presence on the nose from the barrel than the bottle. Smoke is still present, but not as overwhelming. Roast malt, oak, smoke, and dark fruit blend in the aroma and flavor. Blend of the barrel and smoke is smooth and interesting; bourbon is still present, but the wine barrel has fallen out of the flavor. Very smooth, silky body with light carbonation. Having had bottles fresh and aged, and kegs at multiple stages, I'd say there isn't much point in aging bottles longer, but still an interesting beer. 500 ml bottle into a couple of glasses. Pours a black/dark brown in the glass, with a finger of dark mocha. This looks just like the first two in the series, with good retention and lacing. The aroma smells of light smoke, dark fruit, cocoa, caramel and toffee. A touch of sticky charred bourbon hangs on the edges. The taste is tart dark fruit, sticky chocolate and toffee, vanilla, moderate citrus notes and then some heavier roast towards the backend. Some light smokiness hangs in the finish, where it lingers with some leftover dry oak character. The mouthfeel is medium bodied and feels just like the other two beers, with a solid combo of crisp and creamy with a surprisingly well hid ABV. I think this one definitely hit the sweet spot of the three beers in this series. You get a little bit of everything here from both the French Oak and Bourbon barrels plus just the right amount of smoke as well. This was definitely the winner of the bunch for me but they were all interesting in their own way. Thanks to Thorpe429 for sharing a set of these. Served in a Chouffe tulip. A - Pours with a finger of tan foam that settles to a thin ring, leaving behind a few spots of lace and some wisps of bubbles on top. The body is a very dark brown color that is a touch lighter at the fringes. S - This variant is definitely more spirit-forward than the Cabernet one, adding some nice earthy notes as well. Lighter smoke, chocolate, and a light caramel and vanilla note. M - At little less carbonation than the Cabernet version, but still fairly spritzy. Body is surprisingly light for 9.3% and sits in the medium-light range. Alcohol is very well-hidden. D - This was quite good, and was the definite winner of the Fear & Trembling series. The bourbon (Utopias) imparts a nice sweetness that helps attenuate the smokiness of the Cabernet version but doesn't obliterate the base beer with oak and booze. Out of a bottle at capones while talking with mr hill himself. Awesome dude. A- comes to me with a small fizz of tan head that settles quickly and leaves just a few wisps on top. Very dark brown bordering on black with a red brown glow at the edges. S- deep complex nose. Dark roasted malts with some chocolate and dark bread. The barrels play well with each other but hold their own and never get lost. Vinous hits that roll into a sweet bourbon and molasses hit. Over ripe dark berries and grape must. T- opens up with a big time dark roasted malt that's as roasty as it is sweet then the bourbon hits you with a subtle vanilla and molasses sweetness. The wine sneaks in right behind and add a new layer of flavor with the tannic oak and fruits. Hints of brunt nuts. Seriously complex yet very enjoyable. M- on the heavier side of body with a nice stick to it, smoothly coating, and lightly carbed. Just right for the style. O- this is a great brew that really lends itself to a good long journey down the glass. The depth of flavor is amazing yet so easy to drink one could easily have a few. Wow! Good work Shaun thank you so much for coming to philly. 500ml bottle, tasted alongside the other 2 treatments. Pours almost completely black with a moderate tan head that recedes quickly and leaves traces of lacing and very little retention. The aroma is an interesting mix and has the best balance of the treatments with dark chocolate and roasted coffee alongside the light bourbon notes and hints of fruitiness from the wine. The taste follows the nose and does a great job of balancing all the disparate flavors. There is the underlying smoked malts with bakers chocolate and espresso. The finish is dry and smoky but with some sweet burn from the bourbon. Overall, this was the best of the treatments for me as the dry vinous character was balanced more effectively than in the straight cab treatment. Really well-crafted beer. Big thanks to a very generous RPstevens. Pours a brackish, turbid black with some dark brown edging. Capped with a quarter inch of dark tan/brown foam. Looks more like a stout. Smells ... like smoke. Layered with burnt wood, some charred syrup, and smoke. Oh boy. There's some serious smoke going on here. The flavor seems like it's been almost completely obscured/overpowered by charred ash and liquified, salted, beef jerky smoke. Whatever vinous or bourbon-y notes there might have been, they are mere whispers now. If you search real hard, maybe a bit, just a bit, of lingering malt-y/earthy porter-iness. This totally reminded me of salted and smoked jerky. If I didn't know better, I'd say they tossed some charred tabasco or jalapenos in here. Oddly enough, we easily finished the bottle between two of us, despite misgivings. Certainly one of the most unique beers I've ever had. A: Black body with a medium sized khaki cap. Nice spotty lacing. S: Mellow. Smoked, roasted, and charred malts. Oak and dark fruits from the Cab barrels and just the slightest hint of bourbon. T: Yup, you guessed it. Lots of smoked malt. Slight vinous notes from the Cab barrels (but not a s pronounced as in the Cab Barrel verison). Chocolate, and just a dash of vanilla and bourbon. Similar to the nose, there is quite a bit of smoky roasted malts. M: Smooth with a medium body and a nice gentle carbonation. D: The bourbon didn't really do any thing for me to improve what the French Oak Cab barrels did. The second best of the Fear and Trembling series. Big thanks to rpstevens for this bottle in secret Santa! 500ml brown bottle poured into a snifter. A: pours pitch black with a bit of viscosity. Tan head on the pour with pretty good retention and some lacing. S: Huge smoke. Probably too much but not overly abrasive. The smoke definitely does overpower nearly everything. Theres a bit of the Baltic porter left behind everything but it's nearly all smoke and beef jerky like aroma. T/M: More of the huge smoke but not quite as overpowering as in the aroma. The Baltic porter base sticks out a bit more. If I try real hard, I get a bit ofthe bourbon and possibly some notes from the cab barrel. Body is full with smoothing carbonation. D: Split this with Kels and that wasnt too much and I think I could have probably done the whole bottle. Thanks to thirdeye11 for sharing this bottle. Drank alongside the other two Fear and Trembling beers. The beer pours a black color with a tan head. The aroma is pretty similar to the other two beers from this series. I get a lot of smoked malt, chocolate, oak and roasted malt. Not real surprises. The flavor is not surprisingly, a blend of the other two beers. The chocolate is the predominant flavor, but I also get some oak, bourbon, smoke, roasted malt and peet. There is also some dark fruit notes. Easy to drink. The alcohol is fairly well hidden. Medium to thick mouthfeel and low carbonation. Bottle shared by Thorpe429. Thanks Mike! A: Dark brown hue with a thin, tan head that recedes rapidly, leaving but a little lacing. S: Roast, smoke (rauchbier), hints of oak. This beer was less smoky than the French Oak Cabernet version. In general, I found the aroma to be a bit weaker in this blend. 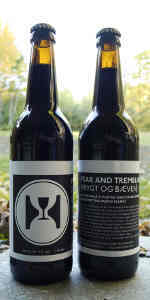 T: A very good beer, with notes of bourbon, oak, subtle smoke, and a tannic / wine characteristics that adds depth and complexity. M: Medium to thin bodied with moderately low carbonation. D: Prior to sampling the three variants, I surmised that this would be my favorite of the Fear and Trembling beers. I preferred the French Oak Cabernet to this. Bottle shared by Grant - thanks! Tasted side-by-side with the other two in the series. Pours black with a one-finger brown head. The head recedes into a thin layer on top leaving solid lacing. Smells of large roasted malts with solid amounts of smokiness. Also present are moderate amounts of tannins, vanilla, and spicy oak, in that order. Tastes similar to how it smells, though with more influence from the bourbon. Robust roasted malt and smoked malt flavors kick things off and are joined quickly by moderate amounts of dark chocolate. Midway through the sip mild amounts of vanilla and spicy oak flavors come into play. Near the end of the sip lightly tart tannins come into play, carrying through to a mildly bitter ending. Mouthfeel is very good. It's got a smooth thickness with grainy carbonation. Drinkability is very good. I finished my glass quickly and could easily have a few more. Overall I thought this was the best of the three in that it was (not surprisingly) the most complex. The barrel-aging was very well done and this beer is worth a shot if you can find one. A blend of what's still hanging on (the bourbon) and what's going the way of the dodo (the cab). Interesting to have all three at the same time where the dichotomy is in full display. Thanks again so very much Mike. A pour from a bottle. Fear and Trembling looks baltic like as it's a very dark ruddy brown that might as well be black. Some nice suds on top of this elixir surprising me as it's a blend from various barrels. No stick though but that could be the glass. Smell is a bit vinious, I get that right up front. It's also smoky as hell from all the smoked malt. Don't really pick up any bourbon, but I do get some wet wood and some chocolate and berry scents. This is one messed up baltic in a good way. I never had the base but would love to try it. Im thinking the bourbon is being masked by everything else but the cab comes through with vinious spirit, berries as well. I cant get around the smoke but it's not killing me, nice chocolate and hits of vanilla. All together though, the roast rules this beer and that's what a baltic is all about. Feel is above medium and the flavors stick around a bit and the red wine especially, the beer is not flat, bubbles are there. I really enjoyed this one. Thanks to an A+ trader, sholland119, for this bottle. Had no idea there were so few floating around - I had some previously at an epic tasting along with the others in a set, but now get to have one all to myself (my lovely wife objects to any smoke in her beer). Poured into my big Terrapin snifter, leaving a bit in the bottom of the 500ML bottle for later dispensation. Black. Ring of head like white hair on an aging accountant. Smoke is the primary driver in the smell: really, the only smell. Nothing else parts the curtain. Fear & Trembling: Mixed Up is par for the course for the triplets. Woodfire blazing up front initially overwhelms the palate, but as the taste buds adjust to the onslaught, other tastes slip in underneath. The cabernet is evident as a dash of wine in the mix underpinned by a healthy, drying factor of oak. Wood-fired bacon is present but doesn't pork the place up. Bourbon? Shows up mainly in the tongue-numbling backdraft, an echo of vanilla & alcohol. 40/60 I could have picked it out without a label, but it does come forward as the beer warms.